Leen's Lodge vacation cabin rentals are located on West Grand Lake in Grand Lake Stream, Maine. West Grand is a large body of water all by itself at slightly over 14,000 acres. Nature has blessed the Grand Lake area with many lakes, streams and an abundance of fish making for truly a fishing paradise. 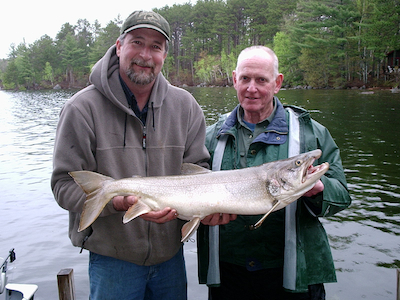 When you consider that from West Grand Lake you can access Pocumcus Lake, Junior Lake and Scraggly Lake, you have over 30,000 acres of water offering the best location for any Maine fishing excursion. 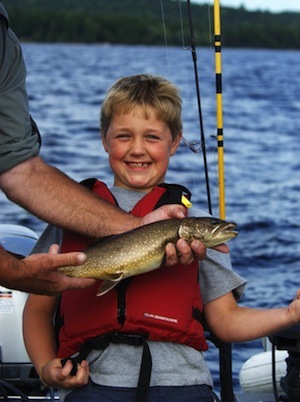 West Grand Lake offers some of the best fishing in all of North America for landlocked salmon fishing , lake trout, and smallmouth bass. Grand Lake Stream is home to one of oldest salmon fish hatcheries in Maine, where fly fishing for landlocked salmon on this 3 mile stretch is beyond world class. 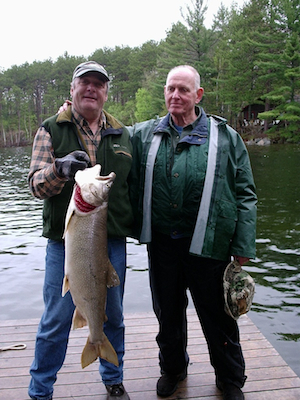 West Grand Lake, Maine, also supports lake trout fishing. These fish need only rocky shoals on which to spawn and rear young. West Grand has an abundance of this type of fishing habitat that an experienced guide can locate. Our season starts in early May with trolling for landlocked salmon and lake trout in the cold waters of West Grand Lake. Later in May, the smallmouth bass start to set up on their spawning beds and the smallmouth fishing starts to heat up. In early June, a fisherman can pursue both landlocked salmon and smallmouth bass as the prime season for these fish overlap. 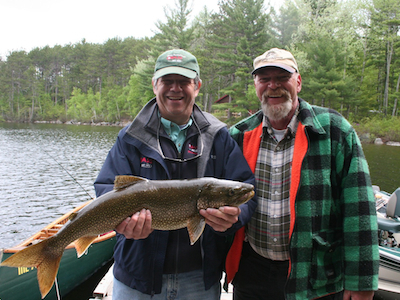 You may want to view the Map of Lakes & Streams near Leen's to help plan your Maine fishing vacation. Canoes and Kayaks are available as rentals as well. Fishing boats are also available for rent on Big Lake. As always, please let us know in advance if you would like us to reserve a fishing boat for you.Leen's has 14' and 16' boat rentals with 9 or 15 hp motors available for your family vacation or fishing trip. The rental fee of $75-$80 per day includes the fishing boat, motor and gas.